There are two ways in which the grid functions to declare the modernity of modern art. One is spatial; the other is temporal. In the spatial sense, the grid states the autonomy of the realm of art. Flattened, geometricized, ordered, it is antinatural, antimimetic, antireal. It is what art looks like when it turns its back on nature. In the flatness that results from its coordinates, the grid is the means of crowding out the dimensions of the real and replacing them with the lateral spread of a single surface.—Rosalind Krauss, “Grids,” October 9 (Summer, 1979), 50. I admit that I had never looked closely at Shaban Hysa’s Më Tej [Further], 1969, hanging in the National Gallery of Arts in Tirana, Albania. The work—which I have elsewhere seen reproduced under the title Elektrifikimi, and referred to a one panel of a triptych, though I have never seen the other panels that supposedly accompanied it—always seemed a rather straightforward image: a man and a woman, standing just to the left of center, consult a large piece of paper, either a map or a set of engineering plans. The man gestures with one arm out towards the space over the viewer’s right shoulder, indicating the expansive work to come. He is speaking. The woman listens attentively, her eyes following his gaze, her hands holding the expanse of paper that contains the plans, the designs, or the outline of the territory that will soon be included (indeed, is already included, but only conceptually) within the painting’s purview. In a truncated space to the left of the figures, a welder completes the skeletal structure of a tower for electrical cables, while to the right, this time in a space that seems to descend too quickly into the abyss of the valley behind them, another figure directs a crane that moves another such electrical tower towards its final position. At far left, more workers ascend scaffolding, and behind all the figures in the painting stretches first a bare valley crisscrossed by large trucks and finally a mountainous wilderness devoid of greenery: grey stone against a yellowish sky. 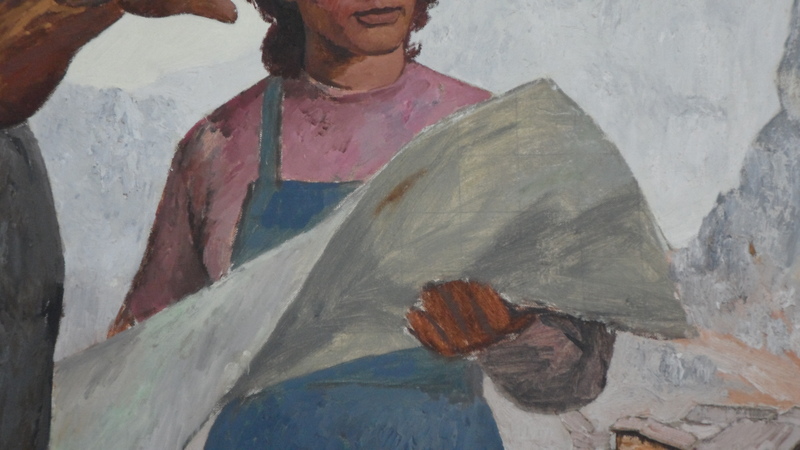 I remember having noticed, before, the way Hysa’s painting looks unfinished; particularly in the figure at right, the work gloves are left as a mass of brushstrokes that lack a clear delineation, and even the folds of the back of the worker’s shirt. The same is also true is areas such as the woman’s hand at center, as it grasps the map or engineering plans. (For the purposes of brevity, I am going to refer to it throughout as map. As we will see below, I do not think there is a tremendous difference between a map of territory and a set of plans for the construction and placement of electrical towers, especially not given what is actually shown in the space of the piece of paper.) These areas of loose brushwork also stand out, and particularly as unfinished, precisely because of the thinness of the paint in these parts of the painting. Elsewhere, for example in the stone upon which the figures stand, the brushwork is just as free and—at close range—abstract, but it is thick with layers and layers of paint that suggest the materiality of the rocks they also depict. Likewise, in certain areas, Hysa has utilized a meticulously linear technique, for example in the rendering of the steel beams of the towers under construction. However, in some cases, he has left the pencil lines used to plan the layout of the lines, their points of intersection and extension. Indeed, in some cases (again, particularly in the figure at left and the tower he gestures the crane to position) it looks as if these pencil lines have actually been applied on top of flat areas of thin color, as if Hysa had laid down a ground, then planned out his lines, then decided to leave both thin ground of paint and lines visible without covering it over in a more meticulous fashion. This gives the painting the look of being incomplete, but as far as I know it was regarded as completed and the version reproduced in several publications during socialism was the same version that now hangs in the National Gallery. Thus, I can only assume that Hysa quite intentionally allowed many areas of the painting to retain an unfinished look, to show the thin layers of paint and even the canvas beneath, to emphasize in places the pencil lines that index the artist’s arrangement and re-arrangement of forms and their contact. In a way, this aesthetic fits perfectly with Socialist Realism, as perfectly as it did with the other Modernists (too numerous to name) who allowed the image to appear in its ‘finished’ state still bearing the marks of its conception and creation. What better way to articulate the labor of creating a work of art? As I examined Hysa’s painting more closely (I admit, I had started to look at it because I wanted the cleaning lady to stop following me so I could covertly snap a photo of another image; I never got the photo of the other image, but I did get a detail of Hysa’s painting), I saw something I never had before. Almost directly in the center of the canvas lies the zone occupied by the map the woman is holding. We can see nothing of the images or words that may appear on it, and indeed much of what we see is the inverse of the paper, a sickly green expanse of loose brushstrokes thinly painted…and there, showing so clearly through this thin stretch of paint, so centrally placed that—in person—I could not understand how I had ever missed it before: the grid. A neat crisscrossing of lines that correspond in no way whatsoever to the forms that are painted over them, left not even as a trace of the specific preparation of the surface to receive the map, but indeed solely to reference the preparation of the surface to receive an artistic image, no particular one. Obviously, the presence of these lines suggests graph paper, suggests the cartographic, geometric division of the map (and indeed, this is why I assume the piece of paper to be a map, rather than a set of engineering drawings), but at the same time the abstract of the grid from the three-dimensional form of the map indicates the ontological priority of the grid itself in relation to the finished painting. The grid in Më Tej indexes not only the process of artistic creation, the preparation of the canvas with a set of lines to facilitate the copying of a drawing that will later be filled out with paint, but also the absolute anti-naturalism of socialist realism’s vision. It is left, I think, so blatant in its pseudo-presence, to show precisely the ambiguous metaphysical gap that exists between the work of socialist realist art and the perceived object of naturalistic painting (‘the world’). As Rosalind Krauss famously puts it in her obsessive study of the grid, “the grid does not map the space of a room or a landscape or a group of figures onto the surface of a painting. Indeed, if it maps anything, it maps the surface of the painting itself” (Krauss, op. cit., 52). However, this ‘surface of the painting’ as it is emphasized by the grid is not any straightforward entity; the grid possesses, as Krauss asserts, a decided ambivalence: it seems to be both rooted in materiality (pointing to the existence of the painting itself as surface upon which paint is dispersed) and spiritual (pointing to the abstract realm of absolute ideas cherished by painters like Mondrian or Malevich). This same ambivalence exists, I think, quite clearly in other forms of socialist realist art in Albania, where art is called upon (and the artist is tempted) both to reflect a kind of purified, simple, and universally accessible materiality and to index the schema of the sacred, to partake in the spiritual elevation of the religious icon. (See, for example, Gëzim Qëndro’s reading of Odhise Paskali’s sculpture Shokët, in “The Thanatology of Hope,” in Lapidari, ed. Vincent WJ van Gerven Oei (New York: Punctum Books, 2015), 61-66.) And it is, it seems, one of the central issues raised by Hysa’s Më Tej. Even the title, Më Tej, suggests the gesture towards another level of understanding and being, an index of a beyond that bears either a merely horizontal relation (as the grid of the map suggests) or else (also?) a hierarchical relation (as the grid beneath the painting suggests). However, the grid here is not merely a self-referential or circular encapsulation of a (tautological kind of) statement art makes about itself. The grid in this instance, showing through the layers of the image in its center, has a quite specific relationship to reality (which I want to distinguish from ‘the world’ as a phenomenological setting that only sometimes coincides with ‘reality’). The grid unfolds in a space that is situated immediately prior to the figures’ current attention: they have looked at the map, and now they look out at where the unfolding grid of electrification (another grid that is both tangible and material, yet also somehow ineffable) will lay over the country. This grid will leave its trace on the unyielding stone of the mountains, much as the words etched on the stone at far right (“25 Vjet Çlirimit” [25 Years of Liberation”]) mark the passage of time and the expansion of man’s influence over the landscape. The grid suggests not just that the expansion of the electrification is in some sense already present in some nascent (or ontologically superior) form long before the territory itself that will be the subject of the material grid of power lines. It also suggests that the progressive expansion of the grid is in some way not a narrative one. The grid at the center of Më Tej in fact simultaneously effects a certain undermining of chronological progression, suggesting an eternity or timelessness that is the other of socialist realism’s assertion on dynamic transformation and progress. 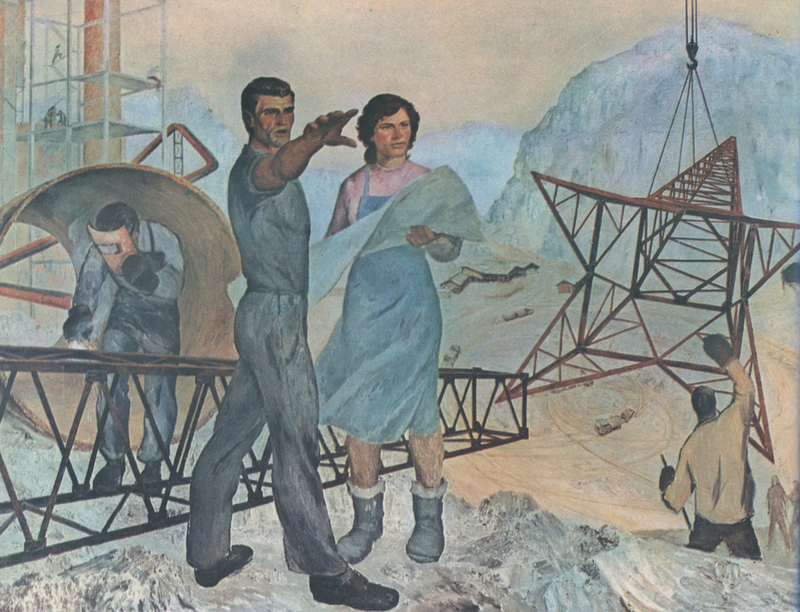 Hysa’s painting, as an image of the Albanian socialist reality (which is not to say, an image of the Albanian socialist ‘world’), emphasizes the irreducible schism between the grid as an element of the expansion (to infinity) of the socialist space and the static pre-existence of that space at an ontologically privileged level. The construction of the electrical field is both necessary and redundant—it makes material and explicit a dispersion that on the one hand must always be physically instantiating and thereby multiplying itself, and on the other hand has no need of instantiation precisely because it remains in the realm of foundational myth, without beginning or end. Ultimately, the thinness of the paint in the region of the map seems to allow the grid to emerge at the conceptual heart of Hysa’s painting, and so its appearance as the logical (as opposed to the compositional) underlying force of the composition, and in this way the grid as eternal paradigm seems somehow the stronger reading in Më Tej. However, as I have tried to suggest, the ambivalence remains unresolved; the role of and emphasis on the grid is ambiguous. This is perhaps one of the reasons behind the intentional incompleteness of Hysa’s painting: it allows the polysemy of the grid to fuse with the polysemy of the ‘reality’ presented, with maximum effect. This effect, of course, is missed if we merely look at the image in reproduction where these details are lost and the material circumstances of the painting are covered over. A question posed by all Realist art, at some level, is: “What is reality? Where can it be found? What is our access to it? What is its relationship to our lives, to our art, to our politics, to our ethics?” The success of Realist artworks—whether they are Socialist Realist, or Photorealist, or New Realist, or Capitalist Realist—depends to a large degree, I would argue, on how successfully the work poses these questions, how deeply it pushes them, not necessarily in the direction of resolution, but in the direction of their own proliferation and epistemological sophistication. Shaban Hysa’s Më Tej raises precisely these kind of questions in the context of Albanian socialist realism. It asks, what is art’s access to reality, and does that access place it before the unfolding project of socialism, or after? Does art possess a narrative power that depicts—in a robust and accurate way—the dynamism of “building socialism,” or does it precisely precede and even undermine all narrative forces, in favor of an eternal instantiation of a fundamental principle? Does the grid, with its metaphysical priority, intervene before our experience of the socialist reality—the point at which is becomes, for us, a ‘world’—or after, emergent in the unfolding of territorial and material-ideological expansion?